Throughout his career Tiepolo painted small pictures of mythological themes, which proved extremely popular. The subjects of these works came from the best–known episodes from ancient literature, but his conception of the stories was varied and original. His depiction of Apollo and Daphne comes directly from Ovid's Metamorphoses. Daphne, the beautiful nymph and follower of the chaste goddess Diana, was pursued by the sun god Apollo, who had been struck by Cupid's golden arrow of love. Fleeing Apollo, Daphne reached her father, the river god Peneus, seen here at left. To avoid Apollo's unwanted advances, she was turned into a laurel tree. The transformation takes place before us as her leg turns into a trunk and her arms sprout branches. The Apollo Pursuing Daphne is unique among interpretations of the theme. Apollo's forward thrust seems to propel Daphne backward in a composition of excited movement. Cupid takes cover from the wrath of Apollo that will shortly ensue, and Peneus remains firmly rooted in an effort to stop the ardent pursuer. The off–center composition, typical of Venetian art, was used by Tiepolo elsewhere but never in such a dramatic and emotionally intense manner. Friedrich Jakob Gsell, Vienna, after 1849; (his sale, held by Georg Plach at the Künstlerhaus, Vienna, 14 March 1872, no 506b). M. de Villars, Paris; (his sale, Hôtel Drouot, Paris, 1 May 1874, no. 85). Édouard Kann, Paris. Mme D[elaney]; (her sale, Galerie Jean Charpentier, Paris, 9 June 1933, no. 28); purchased by (Fort). Pierre Lauth, Paris. (sale, Galerie Charpentier, Paris, 23 May 1950, no. 28). (Rosenberg and Stiebel, New York); purchased 1950 by the Samuel H. Kress Foundation, New York; gift 1952 to NGA. In his introduction to the sale catalogue, Plach explained that Gsell began collecting pictures in 1849 and made his first large purchase at the sale of Baron Samuel von Festetits, Artaria, Vienna, 11 April, 2 May and following, 1850. The painting does not appear in the Festetits catalogue, which was checked by Elspeth Hector, head of the library at the National Gallery in London. According to Paintings and Sculpture from the Kress Collection, Acquired by the Samuel H. Kress Foundation 1945-1951, Washington, D.C., 1951: 158. The sale catalogue identifies the painting as "appartenant à Mme D." Kress 1951: 158, lists a Mme Delaney as the next owner after Kann. A marginal notation in the Knoedler Microfiche copy of the catalogue gives the purchaser as Fort, apparently a dealer. Lauth's ownership is recorded only in Kress 1951: 158. He may have been the seller in the subsequent sale. Fern Rusk Shapley, Paintings from the Samuel H. Kress Collection: Italian Schools XVI-XVIII Century, London, 1973: 149, and Fern Rusk Shapley, Catalogue of Italian Paintings, 2 vols., Washington, D.C., 1979: 1:449, misidentified the owner as M.G., who included only porcelain in this sale. According to Kress 1951: 158, Shapley 1973: 149, and Shapley 1979: 1:449. The Tiepolos: Painters to Princes and Prelates, Birmingham Museum of Art, Alabama; Museum of Fine Arts, Springfield, Massachusetts, 1978, no. 18, color repro. 137. The Glory of Venice: Art in the Eighteenth Century, Royal Academy of Arts, London; National Gallery of Art, Washington, D.C.; Museo del Settecento Veneziano - Ca'Rezzonico, Venice, 1994-1995, no. 114 (London and Washington), no. 61 (Venice), repro. The support is a plain-weave, slightly coarse fabric of medium weight. The ground is a relatively thick, yellowish beige color, and analysis by polarized light microscopy shows it to be a mixture primarily of earth pigments. No underdrawing is visible with infrared reflectography, but the composition seems to have been laid out with sketchy lines of red paint still visible behind Apollo's head and elsewhere. In broad color areas, such as the flesh and draperies, the paint application is thick, dry, and blended with some texture created by the short brushstrokes. Details and overlying shadows were dragged wet-into-wet over these larger areas as fine lines of color or as partially blended strokes of color in which the texture of the brushstrokes remains visible. X-radiographs show extensive and often confusing artist's changes. Thin dry scumbles or smooth thin layers were applied over these and their texture allowed to show through. The clearest changes are seen in the large, light area behind Daphne's head, which may have been a mass of drapery or a branch; in the position of Daphne's right arm, which may have been higher; the raising of Daphne's left knee and in her left leg, which is now shown as a tree trunk; in the forms of the clouds; and over Apollo's left shin, where a bit of drapery was painted out. Cusping is present on the top, bottom, and left edges. The paint was severely flattened during a lining. Scattered small losses are concentrated around the edges and in Daphne's back. Discolored varnish was removed and the painting restored by Catherine Metzger in 1992-1993. Barbara Berrie, Analysis Report of 18 December 1992, NGA curatorial files. Air-path x-ray fluorescence spectroscopy also suggests that ultramarine was used in the sky. Sack, Eduard. Giambattista und Domenico Tiepolo. Ihr Leben und Ihre Werke. Hamburg, 1910. Loan Exhibition of Paintings, Drawings, and Prints by the Two Tiepolos, Giambattista and Giandomencio. Exh. cat. Art Institute of Chicago, 1938: 21, under no. 10. Einstein, Lewis. Looking at Italian Pictures in the National Gallery of Art. Washington, 1951: 104-105, repro. Paintings and Sculpture from the Kress Collection Acquired by the Samuel H. Kress Foundation 1945-1951. Introduction by John Walker, text by William E. Suida. National Gallery of Art, Washington, 1951: 158, no. 69, repro. Vigni, Giorgio. Tiepolo. Milan, 1951: fig. 76. Frankfurter, Alfred M. "Interpreting Masterpieces: Twenty-four Paintings from the Kress Collection." Art News Annual 16 (1952): 129, repro. 124. Morassi, Antonio. "Settecento inedito." Arte Veneta 6 (1952): 91-92, fig. 89. Morassi, Antonio. G. B. Tiepolo. His Life and Work. London, 1955: 151, color pl. 9. Shapley, Fern Rusk. Comparisons in Art: A Companion to the National Gallery of Art, Washington, DC. London, 1957 (reprinted 1959): pl. 50. Mrozinska, Maria. Disegni veneti in Polonia. Exh. cat. Fondazione Giorgio Cini, Venice, 1958: 46. Paintings and Sculpture from the Samuel H. Kress Collection. National Gallery of Art, Washington, 1959: 252, repro. Knox, George. Catalogue of the Tiepolo Drawings in the Victoria and Albert Museum. London, 1960: 49-50, no. 44. The National Gallery of Art and Its Collections. Foreword by Perry B. Cott and notes by Otto Stelzer. National Gallery of Art, Washington (undated, 1960s): 25. Olsen, Harald. Italian Paintings and Sculpture in Denmark. Amsterdam, 1961: 92. Walker, John, Guy Emerson, and Charles Seymour. Art Treasures for America: An Anthology of Paintings & Sculpture in the Samuel H. Kress Collection. London, 1961: 165, repro. pl. 160. Cairns, Huntington, and John Walker, eds., Treasures from the National Gallery of Art, New York, 1962: 46, color repro. Morassi, Antonio. A Complete Catalogue of the Paintings of G. B. Tiepolo. London, 1962: 67. Walker, John. National Gallery of Art, Washington, D.C. New York, 1963 (reprinted 1964 in French, German, and Spanish): 318, repro. Stechow, Wolfgang. Apollo and Daphne. Mit Einem Nachwort und Nachträgen zum Neudruck. 1st ed. Leipzig, 1932. Darmstadt, 1965: 80. Summary Catalogue of European Paintings and Sculpture. National Gallery of Art, Washington, 1965: 127. Cairns, Huntington, and John Walker, eds. A Pageant of Painting from the National Gallery of Art. 2 vols. New York, 1966: 2:340, color repro. Sweeny, Barbara. John G. Johnson Collection. Catalogue of Italian Paintings. Philadelphia, 1966: 75, under no. 287. Cooke, Hereward Lester. Painting Lessons from the Great Masters. Washington and New York, 1967: 234, color repro. European Paintings and Sculpture, Illustrations. National Gallery of Art, Washington, 1968: 114, repro. Giraud, Yves F.-A. La Fable de Daphné. Geneva, 1968: 523. Pallucchini, Anna. L'opera completa di Giambattista Tiepolo. Milan, 1968: 127, no. 253, repro. Fredericksen, Burton B., and Federico Zeri. Census of Pre-Nineteenth Century Italian Paintings in North American Public Collections. Cambridge, Mass., 1972: 198. Shapley, Fern Rusk. Paintings from the Samuel H. Kress Collection: Italian Schools, XVI-XVIII Century. London, 1973: 148-149, fig. 286. European Paintings: An Illustrated Summary Catalogue. National Gallery of Art, Washington, 1975: 338, repro. Shapley, Fern Rusk. Catalogue of the Italian Paintings. 2 vols. National Gallery of Art, Washington, 1979: I:449-450, II:pl. 324. Watson, Ross. The National Gallery of Art, Washington. New York, 1979: 89, pl. 77. Knox, George. Giambattista and Domenico Tiepolo. A Study and Catalogue Raisonné of the Chalk Drawings. 2 vols. Oxford, 1980: 1:225, 253, 271, 335. Walker, John. National Gallery of Art, Washington. Rev. ed. New York, 1984: 346, no. 475, color repro. European Paintings: An Illustrated Catalogue. National Gallery of Art, Washington, 1985: 389, repro. Gemin, Massimo, and Filippo Pedrocco. Giambattista Tiepolo. Venice, 1993: 462-463, no. 479, repro. Longyear, Teresa. 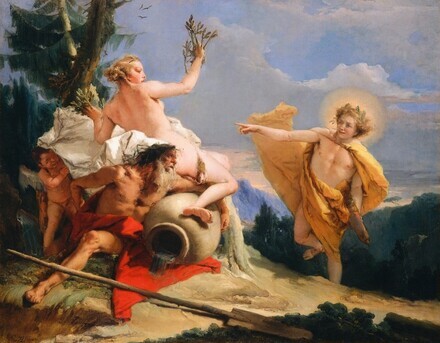 "Giambattista Tiepolo: The Energetic and Fluent Brush." In Beverly Louise Brown, Giambattista Tiepolo: Master of the Oil Sketch. Exh. cat. Kimbell Art Museum, Fort Worth. Milan and New York, 1993: 74, fig.s 47-48. The Glory of Venice. Exh. cat. Royal Academy of Arts, London; National Gallery of Art, Washington; Museo del Settecento Veneziano - Ca'Rezzonico, Venice; Gallerie dell'Accademia, Venice, 1994-1995: 499, cat. 114, color pl. 200. National Gallery of Art. National Gallery of A rt, Washington, Rev. ed. Washington, D.C.,1995: 111, repro. De Grazia, Diane, and Eric Garberson, with Edgar Peters Bowron, Peter M. Lukehart, and Mitchell Merling. Italian Paintings of the Seventeenth and Eighteenth Centuries. The Collections of the National Gallery of Art Systematic Catalogue. Washington, D.C., 1996: 293-297, color repro. 295. Faxon, Alicia Craig. "Metamorphosis." In Encyclopedia of Comparative Iconography: Themes Depicted in Works of Art, edited by Helene E. Roberts. 2 vols. Chicago, 1998: 2:595. Pedrocco, Filippo. Giambattista Tiepolo. Milan, 2002: no. 247/2, repro. Hand, John Oliver. National Gallery of Art: Master Paintings from the Collection. Washington and New York, 2004: 246-247, no. 197, color repro.